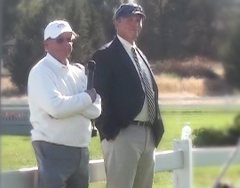 USEF “R” Rated Judges Otis Brown Jr (“Brownie”) and Steve Wall have been involved in the hunter jumper industry for numerous decades, as judges, trainers, riders, breeders and owners. Officiating at top-rated horse shows including derbies, equitation finals and Indoors, both judges crisscross the country from Canada to Florida and from east coast to California. Coming to us from a USHJA Ask The Judge Clinic at the Oregon High Desert Classic Horse Show, we wish to thank Dianne Johnson, Show Manager, of Kirkland, Washington and Dynamic Videos for the footage.